Some GREAT Barrier Reef news!! I have some GREAT NEWS to share with you! 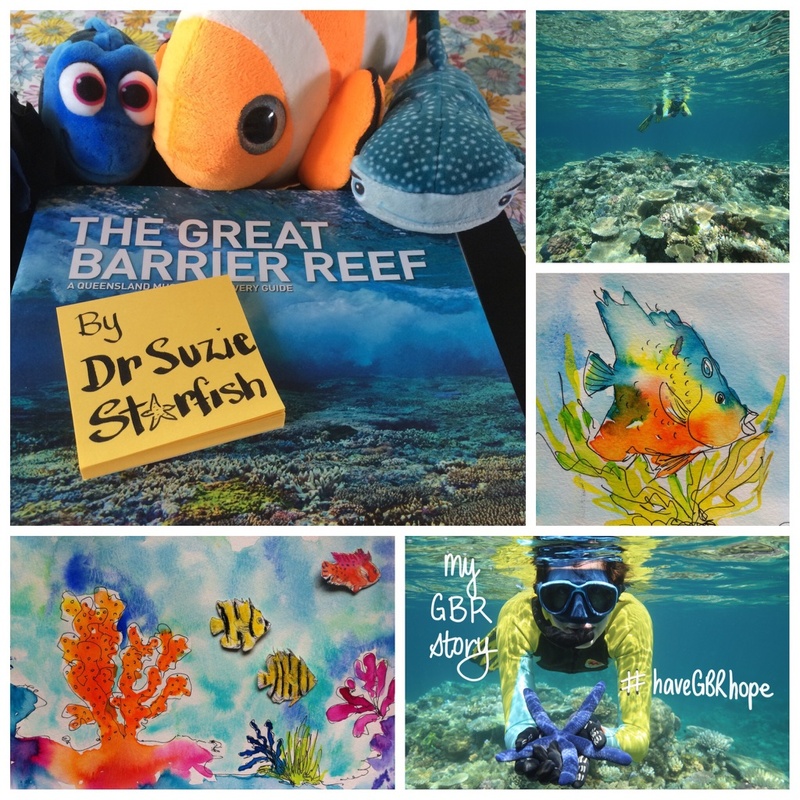 My alter ego Dr Suzie Starfish will be writing, illustrating and publishing her first kids picture book about The Great Barrier Reef with Little Steps Publishing!! I am not usually lost for words, as I can literally talk underwater, but I’m super EXCITED about this new creative collaboration with Little Steps! This story would not have surfaced though if it was not for the encouragement and support of my writing mentor and friend, Michelle Worthington of Share your Story, and my marine biologist for life my hubby Dr Richo. Thank you for encouraging me to just DIVE IN and share MY story! The story is best described through its title, however the title is under wraps at the moment as it is so GREAT! The story is about the impacts on the Great Barrier Reef, both human and natural, and what happens to it when we are not watching. The story is based on marine science and told through the eyes of a feisty female fish named Anthia. Although the storyline is not of happy times on the reef my story is full of hope and ocean optimism as I cannot imagine a world without coral reefs, can you? The manuscript is currently being edited and once the words are right the fun part of illustrating the story begins. You can ‘sea’ some of my preliminary artworks on my website and I will be posting regular updates there on creating the story of The Great Barrier Reef which you can also follow via the hashtag #haveGBRhope. PS. The same week that I found out that my Great Barrier Reef story was going to be published I also received my first rejection letter from a publisher for another fishy tale I have written. To me that no just means no to that book right now, which is all part of the magical and challenging world of writing kids picture books! You can also follow my creative marine journey @suepillans on Twitter and Instagram. Thanks Steph! I’m excited about writing and illustrating my first picture book too! Can’t wait for everyone to ‘sea’ it! Congratulations! It’s such an important message. I wish you success. Thank you Norah. The future of our Great Barrier Reef is so important and this is a story of science and of hope. It’s good to have hope and be hopeful. I agree Norah. We need to share hopeful and positive messages about our oceans to really engage with people. That’s so true. It is difficult to know what to do if there’s no hope.